APR is pleased to present the 2.0 TSI EA888 Gen 1 Stage III GTX Turbocharger System! With the introduction of the Garret GTX2867R Turbocharger, APR has raised the bar further and redefined the standard by which the VAG community measures performance, reliability, drivability and quality. Gone are the days of compromise where low-end response meant excessive backpressure, compressor surge, and extremely limited top end performance. True to APR’s mantra of Performance without Compromise the days of shredding tires on front wheel drive vehicles are rapidly disappearing thanks to the new Gold Standard in ECU torque management calibration strategies only APR can deliver. APR’s endless pursuit of perfection has resulted in the most comprehensive 2.0 TSI turbocharger system in the world. The 2.0 TSI is completely transformed the second it meets an APR Stage III GTX Turbocharger System. Power immediately jumps to 423 horsepower with 387 ft-lbs of torque on tap using 93 octane fuel on a completely stock and unmodified factory fueling system. Switching to APR’s 100 octane race fuel mode, power shoots up to 458 horsepower with 409 ft-lbs of torque all at the driver’s command. This level of extreme performance is just a taste of the system’s full performance capabilities. To learn about each component included in the APR Stage III GTX Turbocharger System, and the advanced engine management, which makes it all possible, click the thumbnails for a larger image and full technical details. At the heart of Stage III GTX Turbocharger System is a GTX2867R turbocharger, which is capable of flowing nearly 50 lbs/min of corrected air flow. This directly translates to large power gains on the 2.0 TSI that continue to grow all the way to redline. The GTX Turbocharger consists of the latest technologies from Le Mans’ winning turbo manufacturer, Garrett Honeywell, and has a track record of reliability and repeatability worthy of complementing an APR Turbocharger System. The internally gated turbocharger features a fully-machined, ten-blade billet 49.7 mm compressor wheel, Inconel 53.9 mm turbine wheel and a dual ball bearing oil and water-cooled CHRA. APR’s Engineers spent countless hours testing turbine inlet and A/R sizes in order to decrease turbocharger lag without negatively impacting peak power. Complementing the turbo’s lightning fast response characteristics is a newly developed anti-surge housing, which enables APR’s Calibration Engineers to deliver massive low-end torque without experiencing compressor surge. Each turbocharger unit is assembled and clocked in house at APR with the necessary brackets to ensure proper wastegate fitment and orientation. Each wastegate is then calibrated for precise operation and control to ensure seamless integration with the expertly recalibrated OEM engine management system. The factory Bosch MED 17 engine management system is responsible for proper operation of the engine during constantly changing environmental and load conditions. With built in compensational data for environmental variables and varying load conditions, the factory ECU is far more complex and intelligent than units found in other vehicle makes and marques. With the significant amount of changes included in the APR Stage III GTX Turbocharger System, APR’s Engineers spent months calibrating the engine management system, including hundreds of hours of in-house chassis dyno development. Drivability, gear changes, cruising and part throttle operation were tuned to operate smoothly as if intended by the OEM through proper torque management. Further development was performed putting the vehicle through performance evaluation and durability testing at the drag strip and road course. APR’s Electrical Engineers built new coding functions, strategies and routines into the ECU to control conditions normally unseen at factory power levels. Thanks to APR’s incredible proprietary calibration suite, data logging software and full access to the coding structure of the ECU, appropriate and intelligent changes are made to ensure flawless drivability and excellent performance without compromise. APR’s Calibration Engineers properly restructured the engine’s volumetric efficiency (VE) model to properly determine the ECU’s calculated load and deliver proper torque management. Thanks to APR’s patented boost control coding and the addition of a 3-Bar MAP sensor, the ECU is able to perform closed loop boost control well beyond relatively low limits dictated by the factory MAP sensor. This directly translates to safer and more predictable operation while additionally producing more power and torque across the entire power band. Additionally, through the properly reconstructed VE model, accurate open loop fueling is achieved, translating to insignificant fuel trim adjustments. Closed loop fueling is calibrated to control lambda perfectly under all operating conditions. Furthermore, compensations, such as ones related to intake air temperature, exhaust temperature, and altitude, are adjusted to handle the larger variances compared to the factory, low output setup. APR’s Calibration Engineers have optimized cam timing, ignition timing, engine load and lambda to provide tremendous leaps in power while retaining the OEM knock control strategy. The result is safely achieved power, optimized for various fuel grades found around the world from low quality pump fuel, all the way to high quality, oxygenated race fuels. Torque management plays a big role in how the vehicle feels and performs, especially during moments of low gear, rapid acceleration. Typically front wheel drive vehicles suffer from excessive wheel spin during these moments due to the massive torque on tap from the Stage III GTX Turbocharger System. Some drivers can find themselves in situations where they are fighting against wheel spin and traction control when they are simply interested in going forward as quickly as possible. This is further compounded by the fact the factory traction control (ASR) system was designed for vehicles producing far less power and torque, resulting in overcompensated ASR interventions. APR’s Calibration Engineers set out to perfect torque management and traction control by minimizing wheel spin as much as possible without neutering the driving experience. A multi step approach was taken to achieve appropriate control. With ASR enabled, forward movement wheel spin will trigger appropriate torque intervention levels to minimize spin without hurting forward acceleration. On top of this, the torque management system is fine tuned to deliver only as much torque as the tires can take. In normal conditions the tires will only slightly break loose under full acceleration, resulting maximum acceleration. In higher traction situations, or with ASR disabled, all of the system’s torque is directly on tap! While the end goal is similar, APR’s torque management system differs greatly from archaic “boost-by-gear” strategies. “Boost-by-gear” strategies rely on a static limitation of boost in an effort to minimize wheel spin, but to work properly they must be dialed in for every situation. The same boost levels in different weather conditions, such as a hot summer day and a cold winter month, can produce vastly different torque levels. Since APR’s torque management system relies on the engine management’s phenomenal torque reporting abilities, it is able to adjust to every environmental situation it encounters. To achieve a targeted torque level, the ECU applies the appropriate changes to mass airflow and ignition. Through further calibration changes APR’s Calibration Engineers were able to increase the acceleration rate of the vehicle. Ignition delays are reduced resulting in a more responsive pedal without altering overall throttle sensitivity and resolution. Drivability was greatly improved by reducing the throttle lag commonly noticed at slow speeds and while reapplying throttle after decelerating. APR’s Motorsport Rev Limiter allows power to climb all the way to redline without dropping off several hundreds of RPM earlier. Lastly, APR’s tried and tested Motorsport Launch Limiter allows the driver to focus on launching the vehicle, rather than controlling the engine speed. Beyond wide open throttle performance, APR’s Calibration Engineers spent countless hours optimizing vehicle drivability under daily, part-throttle, driving. The vehicle fully retains its impressive daily driver status and simply has more power on tap should the driver request more with his or her right foot! APR’s EMCS program switching technology and APR Mobile put control of the ECU in the operators hand to access modes for standard pump fuel, high output race fuel and even reduced output valet modes to protect the vehicle against improper use by other individuals. This technology is patented by APR and is found nowhere else in the world. It’s Performance Without Compromise only APR can deliver! Attached to the turbocharger is APR’s investment-cast, super alloy, nickel-chromium-based Inconel 625 Manifold featuring APR’s Sequential Exhaust Pulse runner lengths. Unlike hand welded tubular manifolds and other cheap cast materials such as iron, Inconel is a very high temperature resistant material designed to withstand extreme exhaust gas temperature changes without expanding, contracting, melting or cracking under stress. Furthermore, the thick casting material reduces unwanted exhaust noise. This material is typically found only at the highest levels of professional motorsport racing where reliability is essential to success. Investment-cast Inconel features heat retention characteristics, which aid in turbo response by keeping the exhaust velocity high. APR’s Engineers designed variable runner lengths calibrated to deliver sequential exhaust pulses without collision. Along with the manifold’s T25 outlet, this aids in turbocharger spool, producing excellent response for immediate torque delivery. A reduction in backpressure from the high-flow, collision-free design directly enhances power delivery far beyond that of the OEM turbocharger manifold and other less effective designs. Backpressure reduction also alleviates most common valve float issues associated with high output factory K04 turbo upgrades and so called small “hybrid” K04 turbochargers. Each unit undergoes strict quality control checkpoints to ensure ultimate reliability each step of the manufacturing process. The unit is CNC machined to tight tolerances and inspected for defects before being packaged and shipped to customers around the world. All of these characteristics result in a manifold designed without compromise backed by a confidence-inspiring lifetime warranty. To provide closed loop boost control at absolute pressure levels above 2.5 bar, APR’s GTX Turbocharger System features an OEM Bosch 3 bar MAP sensor. Altering the ECU to understand the engine is equipped with a 3 bar MAP sensor is a trivial task. The sensor and proper calibration settings come standard on many factory VAG vehicles, but even these vehicles only provide proper closed loop boost control up to 2.5 bar absolute. APR’s electrical engineers went many steps beyond the norm and recoded the factory ECU to deliver closed loop boost control up to 3 bar absolute. This ability, combined with proper torque management, results in safe, reliable, and predictable performance at higher power levels without the need for clumsy and archaic external boost controlling devices. The factory engine management relies on load calculations derived from the mass airflow (MAF) sensor to properly control the engine. All too often this critical component is eliminated from turbo upgrade kits as the factory unit is small and can easily become saturated. The alternative of upgrading the unit is often not used due to the complexity of doing so. However, no task is too large for APR’s Engineering Teams when the sake of reliability is brought into question, and as such APR has engineered a larger housing for use in the Stage III GTX Turbocharger System. To aid in accurate airflow readings, the APR MAF housing features a long, precision-machined tunnel with a honeycomb airflow straightener. APR’s Electrical Engineers make appropriate coding changes to the ECU to understand the larger MAF housing while the calibration experts update the ECU with all of the necessary calibration data surrounding the larger housing’s physical properties. The end results are accurate readings and a further refined driving experience. The MAF housing includes a CNC-bent mounting bracket for a sturdy connection to the engine bay and additional wiring and couplers are included to extend the factory MAF sensor’s harness. Wire reinforced, multi-ply silicone hoses provide an unrestricted path for airflow to enter and exit the turbocharger. The ultra rigid design ensures boost and vacuum piping will not swell or collapse causing leaks and restrictions in the induction and charge piping system supporting boost response and turbo recovery. Each hose is engineered to fit properly into the vehicle's engine bay with all necessary emissions and reference ports securely affixed. APR’s Easy-Flow Silicone Hose design features stepped mounting surfaces for smooth transitions from one pipe to another. Traditional designs simply sit on top of each other, often resulting in a disruptive airflow path. By using the stepped design, hoses fit properly without airflow restrictions, resulting in the most ideal path for moving air through the turbocharger and into the engine. APR’s oil and coolant lines are specific to the APR Stage III GTX Turbocharger System and provide years of leak free operation. The lines feature a flexible braided stainless steel construction with CNC mandrel bent hard-lines for specific and clean routing as if intended by the OEM. Every detail is important, and APR goes the extra mile to ensure any possible weaknesses are eliminated. The Garrett GTX turbocharger’s outlet size, shape, and location differs from the factory turbocharger, necessitating the need for a new Race DP. The APR Stage 3 Race DP features an investment cast, T304 inlet and outlet that perfectly match the 5-bolt flange’s awkward shape. By casting this piece, APR’s engineers were able to make an extremely smooth and organic shape, otherwise not achievable with fabrication alone. The system smoothly necks down to the 76mm design over a long distance, making an ideal flow path for exhaust gasses and power. The flex section is a low-profile design that will not internally fray, billow and fail like others on the market and is TIG welded with argon back purging to the casting. The o2 sensor bung, turbo flange, and mounting bracket flange are all cast into the design, and the mounting bracket itself is made from a thick, high-quality piece of billet stainless. For customers with an APR Race DP Exhaust System, the included portion replaces the upper section and mates directly to the APR Catalyst Midpipe. For customers without an APR Cast Race DP Exhaust System, the APR Catalyst Midpipe is available separately. The midpipe is fully compatible with the factory catback exhaust system. The factory turbocharger features a diverter valve (DV) and wastegate solenoid (N75) directly mounted on the compressor housing, which is removed for the more powerful APR Stage III GTX Turbocharger Unit. As such, APR provides a CNC-machined billet-aluminum DV housing and CNC-bent N75 bracket to conveniently relocate these items within the engine bay. The DV housing is anodized clear to protect against corrosion and the internal mounting surface is precision machined identically to the OEM unit, to ensure a proper, leak proof design. APR provides new vacuum lines and T-junctions. Leak proof connections are easily achieved thanks to the included OEM style crimp clamps. APR doesn’t cut corners even with the most mundane details of the kit. Every nut, bolt, stud, washer, clamp, and gasket necessary for the install is included with the kit. To cope with raised cylinder pressure and temperature, four new spark plugs are included. The plugs operate at a heat range colder than stock, which results in better pre-detonation resistance under extreme conditions. With these spark plugs in, APR’s calibration engineers were able to safely achieve more power, especially in extremely demanding conditions. 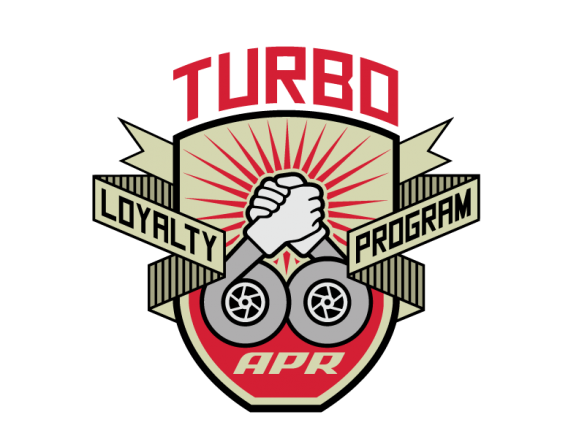 APR has a worldwide network consisting of many professional shops capable of performing an APR Turbocharger System install. To accompany APR’s world-class technical support hot line, APR includes a full, printed, step-by-step install manual to make the install process smooth and simple! Horsepower and Torque was measured in APR’s in-house, soundmaster dyno cell, using a dynapack all-wheel dynamometer. Multiple stock and modified runs were conducted and the SAEJ1349 corrected results were averaged together to represent the differences between a stock and APR Stage III GTX 2.0 TSI. Crank power figures were estimated based on VAG’s factory advertised results. Click through the tabs below to view output using various fuel grades, power measured at all four wheels, estimated at the crank, and the absolute gain over stock. Please note, depending on engine code (CAW_, CBF_, CCT_, CCZ_) factory power output is rated between 170 - 211 PS. The APR FWD Midpipe or APR AWD Midpipe is required if the vehicle is not already equipped with an APR Race DP. The APR Carbon Fiber Intake System is recommended and required to meet the advertised power levels. The APR Intercooler System is recommended and required to meet the advertised power levels. APR cannot make any guarantees as to the longevity of the OEM manual transmission clutch or DSG/S Tronic clutches in every transmission and therefore an upgraded clutch, such as APR's upcoming DSG Clutch Packs, are recommended and may be required depending on the stage, octane, driving style and clutch health. APR’s Stage III DQ250 TCU Upgrade is required for DSG / S Tronic models. Stage III power, torque, boost, cylinder pressure and temperature levels and more are substantially higher than stock. APR cannot make any guarantees as to the longevity of the factory engine internals or all factory components on every engine. As such, APR recommends upgrading rods/bearings and pistons/rings for increased engine reliability and longevity, especially when using race fuel. NGK BKR8EIX, gapped to 0.022" ±0.002" or 0.55mm ±0.05mm with a change interval of 10-15,000 mi or 16-24,000 km spark plugs are included and required. APR recommends using Motul oils, coolants and lubricants. APR strongly recommends an ester based oil, such as Motul 300V. *The Upgrade System REQUIRES a 3 bar map sensor. *Software will not be made available without previously owning an APR Stage III or III+ Turbocharger System.